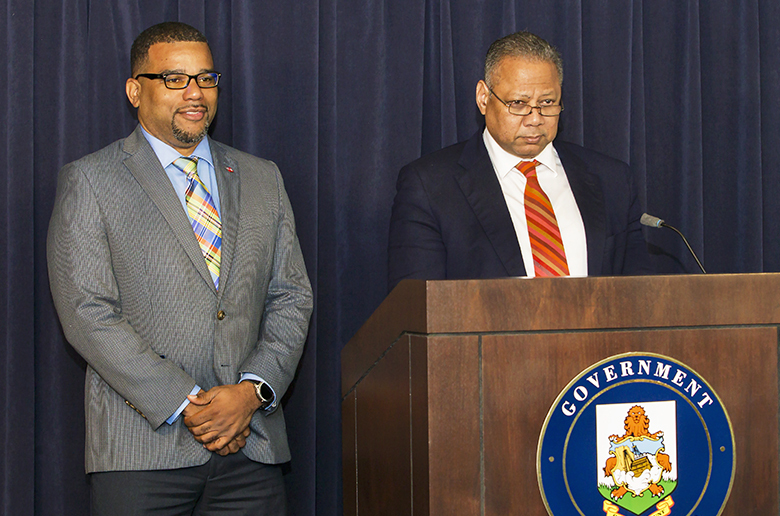 [Updated] Minister for the Cabinet Office Walton Brown and the Minister of Education Diallo Rabain are holding a press conference this morning [March 21] to provide an update on the school maintenance reports. We will have additional coverage later on and in the meantime the live video is below. “Thank you for joining me. On the doorstep and out in our community in the lead-up to the 2017 General Election, we repeatedly heard from teachers, parents and even students about the worsening conditions in some of our public schools. We listened and took action. “In our first 100 days, the Government directed the Ministry’s Office for Safety and Health to conduct an urgent review of the health and safety in all public schools to ensure that our students and teachers are learning and working in a safe environment. The Safety and Health Coordinator’s Office commenced the initial process of inspecting all public schools and their related facilities on 21st August 2017. These inspections were completed on 13th October 2017. “Following the logging and updating of the data, the report was transmitted to the Ministry of Works. “Generally, all schools were deemed to be relatively safe, within time and scope comparative to their operations and related practices. “It was concluded that no immediate risks to the health and safety and well-being of teachers and students were posed. “Schools were determined to be fit and proper for occupancy and normal use as teaching, learning and working environments. “However, all of the schools had challenges relating to sanitation and hygiene, maintenance and upkeep of their buildings and related facilities. “There were some schools which had some mould issues, but overall, the majority of findings concluded that no school had any issues or concerns that were identified as significant enough in nature or scope to warrant closure or otherwise unsafe for occupancy and use. “Where there were high risk findings, these were addressed in consultation with the Ministry of Works and the Ministry of Education Facilities Section, on an urgent basis during the course of the Review process. “Last year, following our initial report assessment and findings, we launched a follow up inspection process to review the corrective actions taken to address the findings previously identified. “To this end, the Office of the Safety and Health Coordinator along with representatives from the Ministry of Public Works and the Ministry of Education started the verification inspection field works on 17th September 2018 and completed the process on 17th October 2018. “The generation of individual school reports commenced on the 22nd October 2018 and were completed and circulated to the representatives of the Ministries of Public Works and Education that participated in the field work exercises. “Final return submissions after review by the Ministries of Public Works and Education were returned to the Office of the Safety and Health Coordinator during the week of the 23rd November 2018. “As a matter of priority during the timeline of receiving the original and follow up reports, I can confirm that a concerted effort has been undertaken to ensure that every school undergoes a consistent maintenance routine. “This includes scheduled and timely upkeep and repair activities so that schools are being optimally cleaned and maintained in an acceptable state on a regular basis to ensure the safety, health and wellbeing of our teachers and students. “This Government has made a clear commitment to ensuring the health, safety and wellbeing of all its employees. The safety and health of our students and teachers is paramount and we are committed to maintaining a safe learning and working environment for our children and teachers. “Since taking office, ensuring safety within our schools has been one of our top priorities. “All buildings in Bermuda, generally, have to deal with mold issues and our schools are no exception. In addition, despite our best efforts, our school buildings are aging – with the youngest building being over 50 years old. We are at the stage where rebuilding is needed, and this is a direction we must seriously begin to look at in the near future. “I am grateful for the work done by the Cabinet Office Minister, Walton Brown, and the Health and Safety Officer, in providing this comprehensive report that has helped our facilities team and guided our efforts to maintain our buildings. “We maintain regular checks to monitor building health and are proactive when it comes to treating issues found. Working alongside the Ministry of Public Works, any problems properly reported are immediately electronically logged, categorized and resources assigned to the issues as soon as possible. Can’t comment ’cause couldn’t watch but guessing they want us to thank them for doing something amazing…..like working? I suppose Walton Brown has to justify his job somehow but what does the Cabinet Minister have to do with school maintenance? Why does there always have to be a press conference to announce everything? Just get the work done! !